This collection of Rob van der Hoeven excavates moments, re-presents the past and illuminates possible futures in an exhibition that invites dialogue. The work of Dutch artist Rob van der Hoeven, currently on show at the Bob Smith Gallery in Rotterdam, is saturated with a sense of the past, the German and European past. Although Van der Hoeven is Dutch, his parents were victims of Hitler's continental slave empire. His Polish mother and Dutch father were rounded up and sent to Berlin as forced laborers. There, amidst the carnage of warfare, they met and fell in love. As the Red Army advanced from the East, the young couple fled westward and, in 1945, Year Zero of European History, they found refuge in the Netherlands, where they married and raised a family. Some of Van der Hoeven's pieces are postmemory interventions, products of an intellect that understands European history through public mediations, but more intimately, by means of the stories and the silences experienced at home. Nazism was a catastrophe for Germany and its neighbors (Rotterdam itself was demolished by the Luftwaffe in 1940), but for Van der Hoeven, on a personal level, the ambiguity lies in the fact that an unintended consequence of Hitler's rule was a love affair between a Polish-Dutch couple. To this extent, the life of Rob van der Hoeven is a history of post-war Europe. 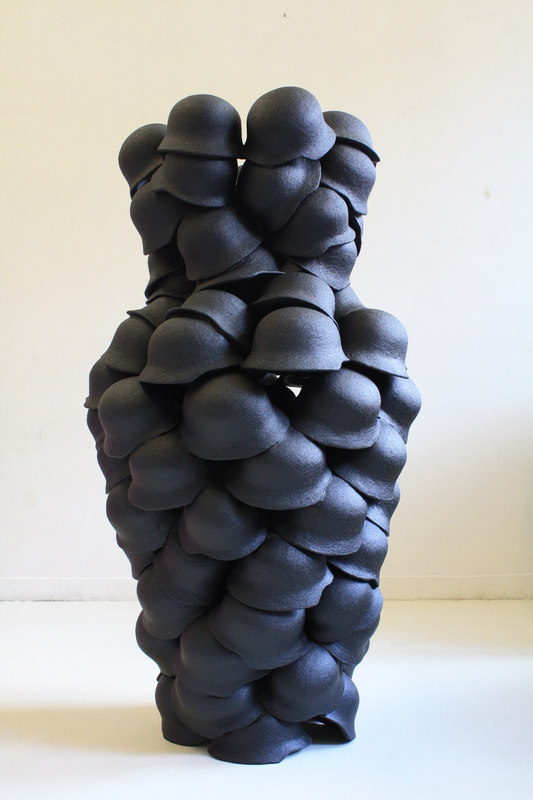 Excavation, is a pile of helmets of the type worn by German soldiers during World War Two. They invoke a funeral urn, or perhaps a pile of stones on a mountain marking the place where a walker has been lost. The piece plays with a number of tensions. Each of the helmets represents a soldier lost, but these were soldiers of the evil empire, never publically mourned. Each helmet is clearly artificial (they are plastic), but the "real" German helmet itself, thoroughly reconfigured and commodified in pop culture, has become a clichéd symbol of evil. P is a large woolen tapestry. It reminds us immediately of the yellow star worn by Jews under the Nazis. The letter "P" re-presents the badge that Polish forced laborers, like the artist's mother, were forced to wear. Van der Hoeven has appropriated a symbol of oppression and now exhibits it with gusto. The P has come to represent Pride. Germans once forced Polish prisoners to wear this badge. Now German tourists (there are many of them!) visit the once bombed city of Rotterdam. Some find their way to the Bob Smith Gallery and admire the oversized badge of this Dutch artist, himself the unintended product of German megalomania. And so things move on in an ever-changing play of ambiguity that comprises the contested and constructed nature of collective memory. Es War Einmal [Once upon a time] plays with the relationship between individual and collective memory. 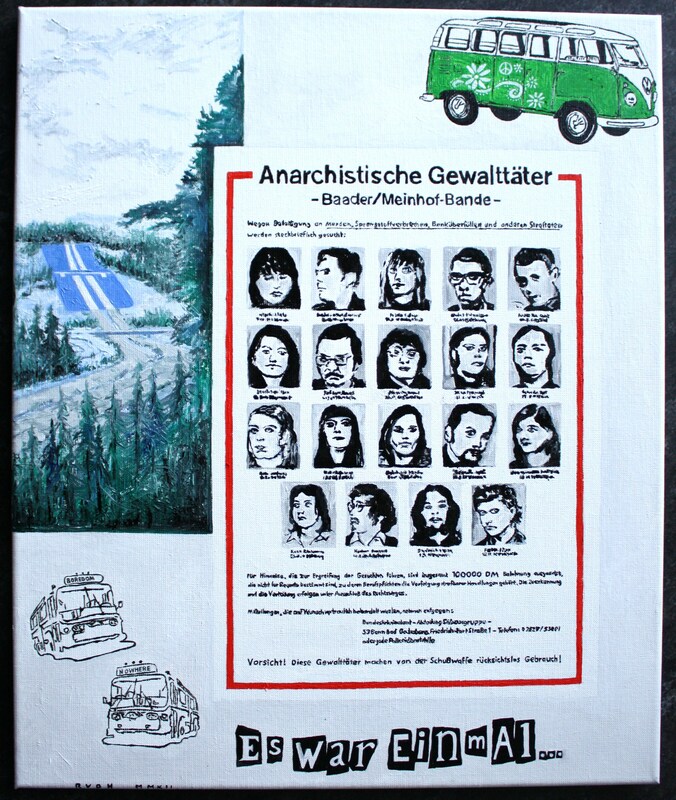 It re-presents a poster of the members of the Baader-Meinhof Group (the so-called Red Army Faction - a group of leftist radicals who turned to terrorism during Van der Hoeven's teenage years in the 1970s). The poster is mounted on a canvas with a painting of a forest overlaid with the symbol for motorway. Forests of mythical German lore; autobahns that were built on the orders of Hitler. The top right hand corner has a painting of a Volkswagen van - the type that was popular among hippies and young social drop-outs during the 1970s, (Let's not forget, Volkswagen was created by the Nazis.) In the late 1970s the poster was found in police stations across Germany. But teenagers hung the poster wherever they gathered, in an act of rebellion. Villains in the eyes of the post-war leaders of the Gated Community that was West Germany, the Red Army Faction were heroes to the anti-establishment youth. The same poster, but in one context it shows criminals; in another it shows heroes. Van der Hoeven shows us that our symbols experience slippage in meaning. How we interpret them depends on the horizon that we draw around us. How we remember, reflects who we were then and who we are now. Van der Hoeven's works are not easy viewing. The shiny materials used (lots of plastic) attract and repel at the same time. The surfaces are smooth, often monochrome. The temptation for the viewer is to stop at the surface, to conclude that there is no need to delve deeper. But these are works that reward slow viewing and reveal multiple meanings. Take the abstract Shelter I for instance. Four pieces of polystyrene form a large rectangle in white, grey and two shades of blue. Curvilineal pieces within the whole fit together, like pieces of a jigsaw puzzle. The smooth surface is punctuated with regular, darting incisions, like little waves. The regularity, limited palette and carefully constructed composition recalls the controlled works of Piet Mondrian. But when viewed from a distance, it becomes a synthetic camouflaged net, like the ones used by armies and, most often these days, by the millions whose dreams are of refuge in peaceful and prosperous Europe. Camouflage, of course, is normally green and khaki. This one is blue, white and grey, the color of the sea that forms the bridge that reaches Europe, or the watery grave. 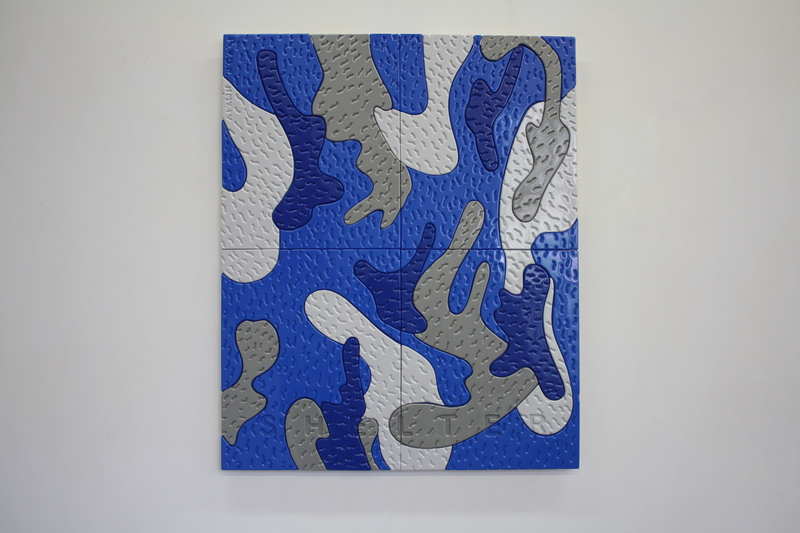 But at another level, this piece is telling us that we all pieces of a net(work) that forms a camouflage. We adjust ourselves in order to fit in, to become an insider communicating with the others within our (gated) community, shutting others out. The camouflage does its job. A gated community is a fenced-off space, a protected, well-defined environment. Entrances and exits control who enters and who leaves. Exchange, with the Other is limited. Van der Hoeven's Gated Community questions the limitations of the encapsulated life of the bubble. 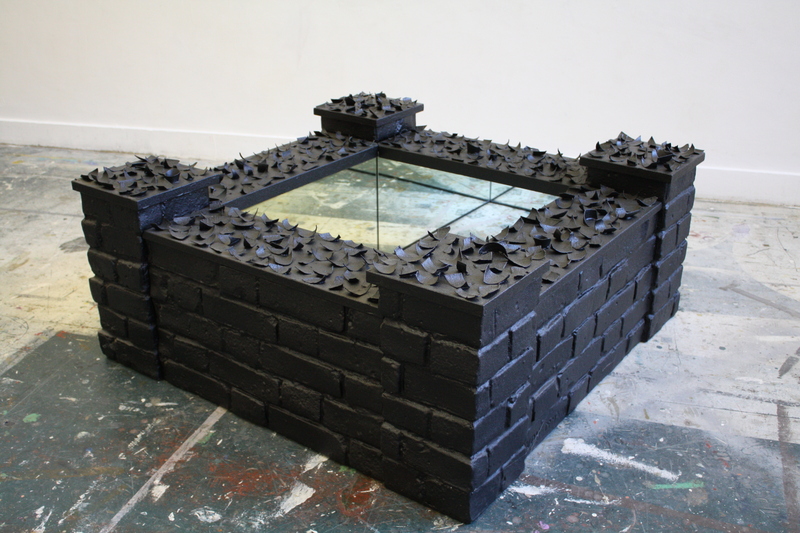 Brick walls, again sprayed in black, are topped with what look like glass shards. Within lies a sanitized space, lined with mirrors. It could be Nazi Germany. Or Germany east of the Berlin Wall. Or it could be Post-Brexit Britain. Or Trump's America. Close down the borders and draw up the bridges; let us contemplate our own reflections while the trade wars begin. Gated Community comes from 2014, well before the rise of Trump and the triumph of the Brexiteers. Van der Hoeven's plastic sculptures link the personal and the collective, the past and the present. Sometimes, uncomfortably, they even speak of possible futures. Rob van der Hoeven, Gated Community, continues at the Bob Smit Gallery (Slaak 20, Rotterdam, the Netherlands) through April 14th.